Keep track of your life with One.com calendar. The calendar is connected to your email account on your personal domain. You can create as many email accounts as you want. For each account you can create as many calendars as you need. Connected to each email account is a default calendar. This calendar is your master calendar, it is shown at the top of the list and cannot be deleted. You can change the default calendar under Calendar options. To access your calendar, log in to Webmail and click Calendars at the top of your screen. Quickly navigate to a specific date using the mini calendar in the top left corner. Click Today to jump back to today or use the arrows to navigate backwards and forwards. Depending on your preference you can change the view to Day, Week, Month or Agenda. Sync your calendar to other devices and applications with Mobile Sync and CalDAV. That way you never have to miss an appointment. Check one of our guides below to learn more. 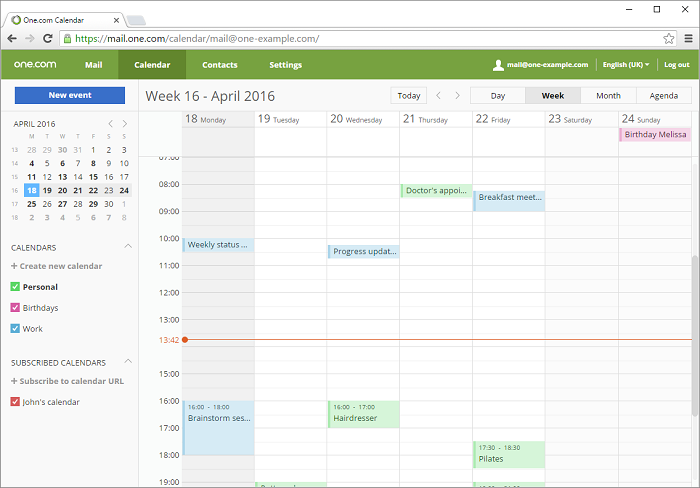 You can create additional calendars, for example one for work appointments or birthdays. Give each calendar a different color to keep an easy overview. You can create as many calendars as you want. To the left of your screen under Calendars, click + Create new calendar. Enter a name for your calendar and choose a color. 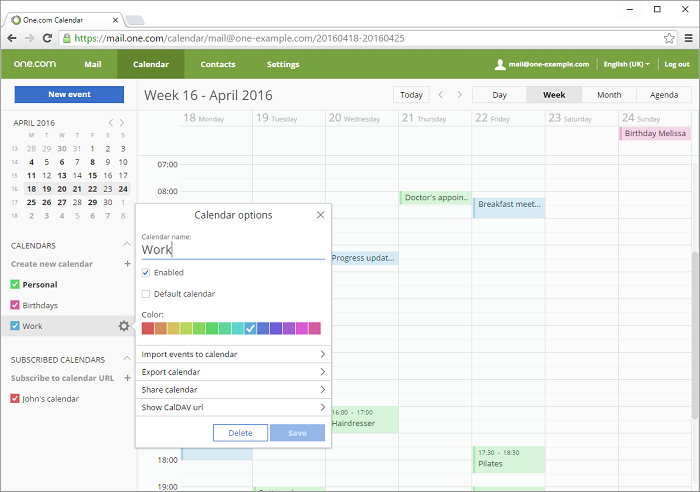 You have several options to manage your calendar, for example color and sharing. Hover over a calendar and click the cog wheel to open Calendar options. Calendar name - The name of your calendar visible in the list to the left. Enabled - This box is checked when the calendar is active. Uncheck it to remove the calendar from the overview. Default calendar - Check this box if you want to make this your default calendar. Your default calendar is shown at the top of the list under calendars and cannot be deleted. 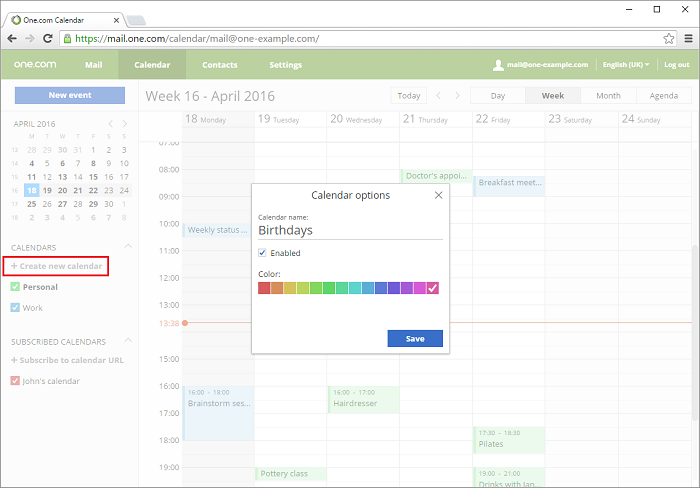 Color - Select a color for your calendar to easily recognize to which calendar an event belongs. Import events to calendar - Click here if you want to import events in .ics format, for example another calendar or a flight schedule. Export calendar - Export all events in your calendar in .ics format. Share calendar - Click here if you want to share your calendar with others. It will be synced continuously. Show CalDAV url - With CalDav you can view and edit your calendar in other applications, outside Webmail. Here you find the URL that you need to add to your external application. Delete - Click here to permantly remove the calendar. Note that it's not possible to delete your default calendar. You can set another calendar as default. It is possible to subscribe to other calendars, for example those of colleagues or your partner. Subscribed calendars are synced automatically whenever the owner makes any changes, but you cannot edit it. To the left of your screen, click + Subscribe to calendar URL. Paste the iCal link of the calendar you want to subscribe to.